I have been MIA with my crafting as I was dealing with the passing of my uncle which has been a great loss to our family. I previously signed up for a Pail Swap Exchange so I had to follow through with my commitment and get this project done. The requirements were to decorate a pail to my partners liking, make some homemade flowers and add 2 packets of seeds. Of course I threw in some fun crafty items as well. When I think of homemade flowers I think of my Artiste cricut cart!! I LOVE all the CTMH cricut carts but this one has a special place in my heart when I think of flowers. 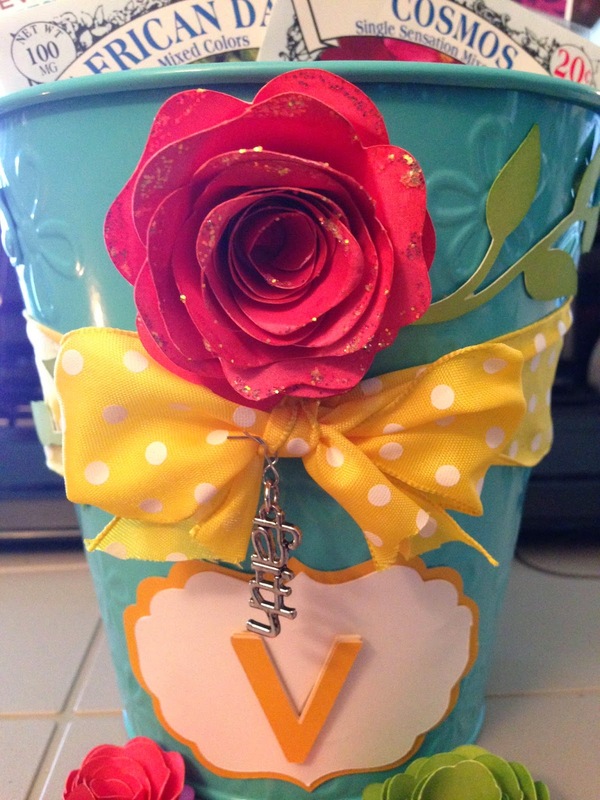 Here is the pail I submitted and I happy to report my swap partner loved it ..Yay Me!! My swap partners favorite color is yellow. So I had some fun picking out this ribbon at Michael's. I tied a cute bow and added a charm that says "Faith". I made this adorable flower using pg 54, Accent 2 cut at 5 inches. After I rolled it I accented with stickles. I added branches behind the flower using pg 54 shift lock, 3D object. 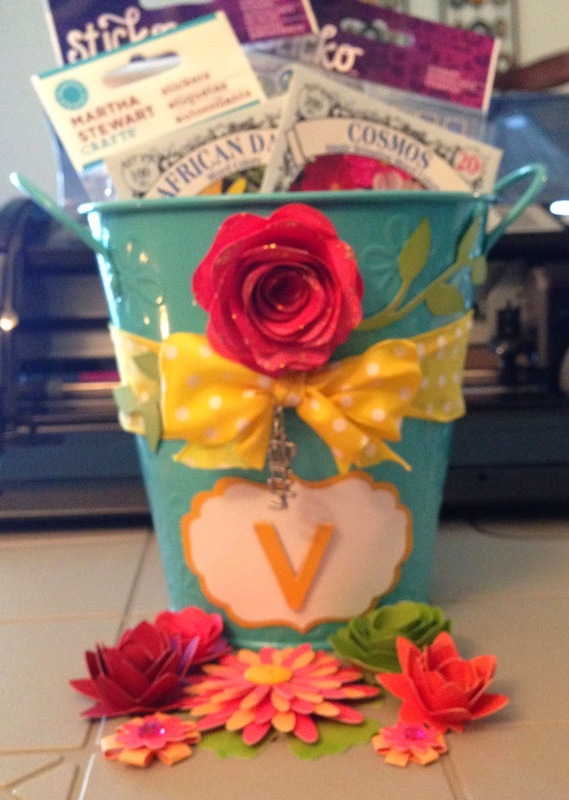 I decided to use her initial to accent the pail so I cut out the letter "V" 9 times and glued them on top of one another for added dimension. The decorative shape is cut from pg 71, shift lock Accent 1. I used two different sizes and layered the card stock. Last but not least I had fun making flowers. I used flowers from pg 54 & 55. I used CTMH card stock for all of the flowers. It was tons of fun putting together these pretty flowers for my swap partner to use. Yes uncles can be like fathers. I said a prayer for you. Looks like a fun swap! How cool is this!! Love the colors! !